It contained his photo, and a black and white version of his painting called ‘The Amazon’ for which his daughter Eileen modelled, sitting on a horse and holding a spear. It was exhibited at the Royal Academy in 1910. 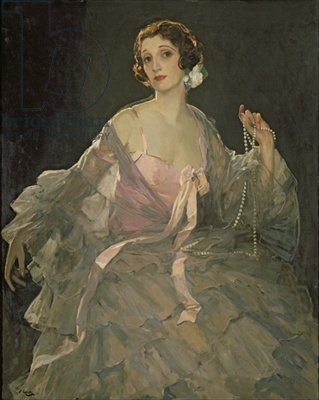 The caption read: “Mr John Lavery belongs to the lucky band of artists, small in number, who gain appreciation in their own day, and that with no sacrifice of their ideals. ‘The Mother’, ‘Springtime’, ‘Ariadne’ and ‘Waiting’ had been exhibited in Venice in 1910, and the four printed reproductions were now being published for the first time by publishers and printers Eyre & Spottiswoode Ltd. of London. Prices ranged from half a crown to just under £1 per copy. Born in Belfast on March 20 1856, John Lavery (left) was the son of an impoverished publican. He lost his father at the age of three, and when his mother died shortly afterwards he was sent to Scotland to live with relatives. At the age of 17 he was apprenticed to a photographer in Glasgow, J.B.McNair, and learnt how to retouch negatives and prints — using a camera to assist with composition in his youth. He also worked as a clerk in a railway office and in a pawn shop. His art training was at Haldane Academy of Art in Glasgow, Heatherley’s School of Art in London, and the Académie Julian in Paris. 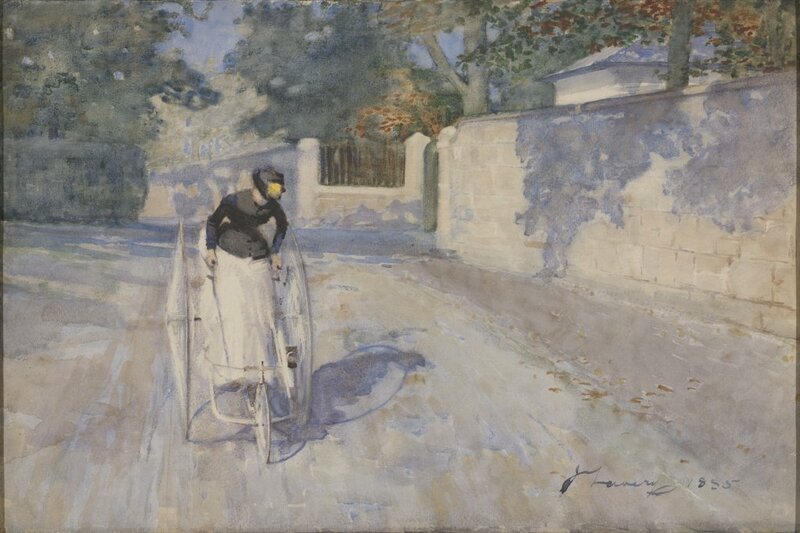 Around 1880 he was painting in Helensburgh and Rosneath with fellow Glasgow boys James Guthrie, later Sir James and a Rhu resident, and Joseph Crawhall — and in 1885 he made the decision not to return to Paris because he felt that a Guthrie painting was better than any he had seen abroad. He was also a visiting tutor at the classes run by Mary Park and Madge Ross at The Studio at 8 then 3 Prince Albert Terrace in Helensburgh’s Victoria Road. 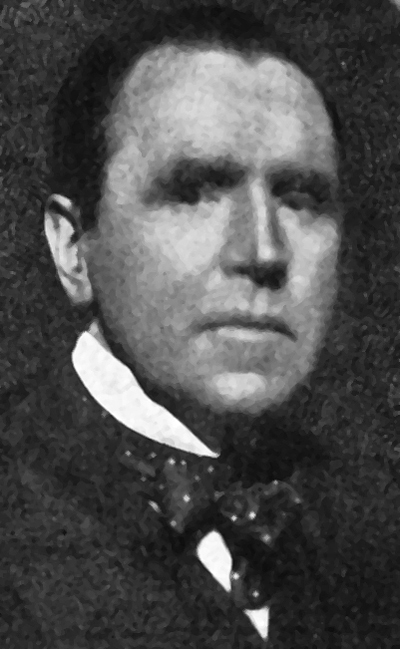 In 1888 he was involved in the interior decoration of Glasgow City Chambers, painting murals at the request of the renowned Helensburgh architect, William Leiper. That year he was commissioned to paint the state visit of Queen Victoria to the Glasgow International Exhibition in the year of her jubilee. This launched his career as a society portrait painter. The following year he wed Kathleen MacDermott, with whom he had daughter Eileen (left). Three years into their marriage his wife contracted tuberculosis and passed away, leaving him a widower at 35. In 1896 he moved to London, where he became the vice-president of the International Society, which hosted international art exhibitions in the city. 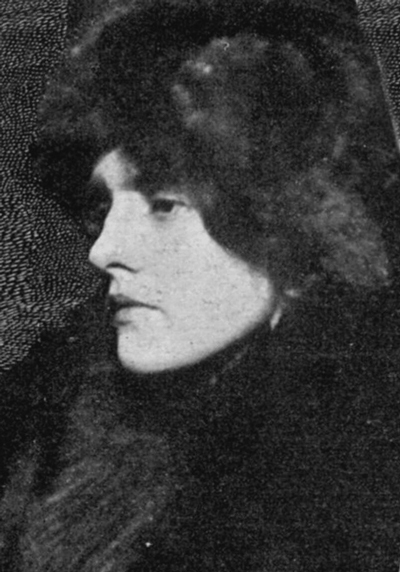 During a trip to Brittany in 1904 he met Hazel Martyn, the daughter of a wealthy Irish-American industrialist from Chicago, and in 1910 the couple wed.
Hazel was an amateur artist herself, and modelled for her husband’s paintings. She shot to fame, becoming a national icon when her face was used on the Irish pound. The relationship was a tempestuous one, with accusations of adultery on both sides. However her social accomplishments were one of the reasons for his success in the higher echelons of society in both Britain and the Continent. In 1912 he painted a portrait of the Moroccan royal family, and the following year was commissioned to paint portraits of the British royal family for the National Portrait Gallery. He was appointed an official artist in the First World War, but ill-health prevented him from travelling to the Western Front. Then a serious car crash during a Zeppelin bombing raid kept him from fulfilling this role as war artist. Instead he mostly painted boats, aeroplanes and airships. During the war years he was a close friend of the Liberal Prime Minister Herbert Asquith and spent time with his family at their home beside the Thames, painting their portraits and idyllic pictures like ‘Summer on the River’. He was knighted in 1918 and became a member of the Royal Scottish Academy, the Royal Academy in 1921, and academies in Rome, Antwerp, Brussels and Stockholm. During this time, he and his wife were linked with the Irish War of Independence and the Irish Civil War. They gave the use of their London home to the Irish negotiators during the talks leading to the Anglo-Irish Treaty. After Michael Collins was assassinated, he painted ‘Michael Collins, Love of Ireland’, which is now in the Hugh Lane Municipal Gallery in Dublin. In 1929, he made substantial donations of his work to both The Ulster Museum and the Hugh Lane Municipal Gallery, and in the 1930s he returned to Ireland. He received honorary degrees from the University of Dublin and Queen’s University Belfast. He was also made a free man of both Dublin and Belfast. A long-standing member of Glasgow Art Club, he came back regularly to exhibit at the club’s annual exhibitions. After the death of his wife in 1935, he completed portraits of a number of public figures, including the writers J.M.Barrie and George Bernard Shaw, and later the actress Shirley Temple. He kept on painting and exhibited his work at the Royal Academy. When the Second World War broke out, he retired to Rossenarra House, Kilmoganny, County Kilkenny, where lived until his death on January 10 1941 aged 84. He was buried at the Putney Vale Cemetery in the London suburb of Wandsworth.